On the hoofs of the Celestial Steed, Blizzard is now offering another way to separate players from their money. For the most part, Blizzard has stayed away from the free-to-play business model, mostly because there are still 12 million people who are happy to drop $15 a month on the flagship MMO World of Warcraft. But that doesn't mean the powers in Irvine aren't above a few cosmetic micro-transactions. 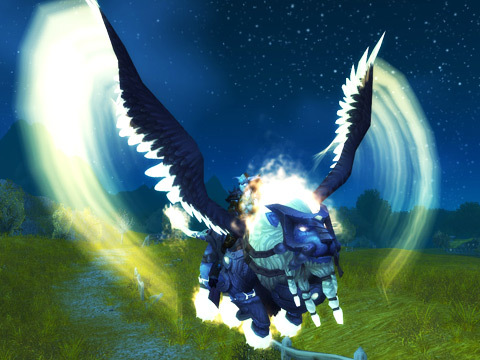 Mini-pets like the Pandaren Monk and the Cenarion Hatchling were sold at $10 a pop to help raise money for good causes, but last year Blizzard raised the stakes by selling a mount for a steep $25. The Celestial Steed sure was pretty, but gamers balked at the perceived money-grab. 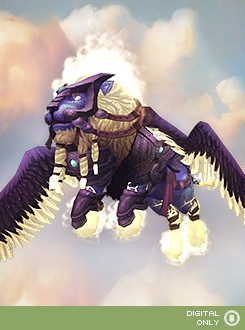 Now, the Steed is joined by the Winged Guardian, a new mount that fits the theme of the latest Cataclysm expansion. "When you take to the skies astride a blazing, eagle-winged lion, your comrades will know you mean business. Serious business," the description on the Blizzard Store reads. "So saddle up, because this flying mount will travel as fast as your riding skill will take you, and it can even travel at 310% speed if you have at least one other 310% speed mount." The Winged Guardian will still set you back 25 bones, but good luck trying to buy one in the next few days. The Celestial Steed had a queue of over 80,000 people waiting to get the digital delivery, and the comments over at the official Blizzard site is any indication there is already a waiting list 3,000 strong. Head over to the Blizzard Store if you're interested. I like playing WoW as much as my schedule permits, but I don't think I would ever purchase a downloadable piece of content like this. But c'est la vie.